Molzym’s standard high quality products for daily routine PCRs comprise a variety of highly active Taq DNA polymerases. 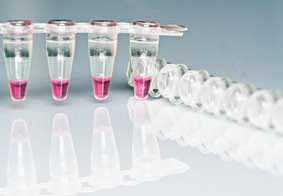 The products suit all applications of PCR and Real-Time PCR assays. MolTaq is Molzym’s highly processive thermostable Taq DNA polymerase with 5’-3’ exonuclease activity useful for research and routine PCR. MolTaq kits can be applied in amplification-based analyses, including exact analyses of SNPs, human, animal and plant genetic markers, molecular epidemiology, molecular ecology as well as animal and plant breeding, food and water quality control, sequencing reactions and gene expression studies. A variety of kits are available to meet your needs for high performance PCR amplification in daily routine. MolTaq is the standard Taq DNA polymerase kit supplying PCR buffer (1.5mM Mg2+) and PCR enhancer for high GC content targets. MolTaq basic enables optimization of PCR amplification by variation of Mg2+ concentration (basic buffer and extra 100 mM Mg2+ solution). Solbach P, Chhatwal P, Woltemate S, Tacconelli E, Buhl M, Gerhard M, Thoeringer CK, Vehreschild MJGT, Jazmati N, Rupp J, Manns MP, Bachmann O, Suerbaum S (2018) BaiCD gene cluster abundance is negatively correlated with Clostridium difficile infection. PLoS ONE 13(5): e0196977. Wurdack M, Polidori C, Keller A, Feldhaar H, Schmitt T (2017) Release from prey preservation behavior via prey switch allowed diversification of cuticular hydrocarbon profiles in digger wasps. Evolution 71, 2562-2571. Shaw LP, Harjunmaa U, Doyle RM, Mulewa S, Charlie D, Maleta K, Callard RE, Walker AS, Balloux F, Ashorn P, Klein N (2016) Distinguishing the signals of gingivitis and periodontitis in supragingival plaque: a cross-sectional cohort study in Malawi. Appl Environ Microbiol 82, 6057–6067.